LEXINGTON, Ky. – Fueled by a seven-run inning, No. 16 Kentucky erased both four-run and three-run deficits to score a 13-7 victory over Cincinnati in front of 2,150 fans at Cliff Hagan Stadium on Tuesday night. The win pushed the Wildcats’ home record to 13-1 with No. 22 Vanderbilt set to arrive on Friday for a three-game weekend series. Despite falling behind 4-0 before ever coming to the plate, the Cats (19-7, 5-1 SEC) chipped away at the Bearcats’ lead with three runs in the second inning to pull within one. Luke Becker’s home run in the third gave UK momentum after Ryan Noda’s second homer of the game had pushed Cincinnati’s lead back out to 6-3 in the top half of the inning. That was all Cincinnati would get until the ninth inning, as junior lefty Brad Schaenzer came on in relief of freshman starter Zack Thompson and pitched 4.1 innings, only allowing Noda’s second home run. Senior left-hander Colton Cleary, who transferred to UK from Cincinnati over the summer, struck out three of the five batters he faced to help hold the lead after the Cats rallied for seven runs in the fifth. The inning was aided by a pair of hit batters, one with the bases loaded that forced in a run, and a pair of bases loaded walks that scored two. Junior first baseman Evan White stroked a two-run single to right field and later stole home as part of a double steal attempt, creating breathing room for the Cats. 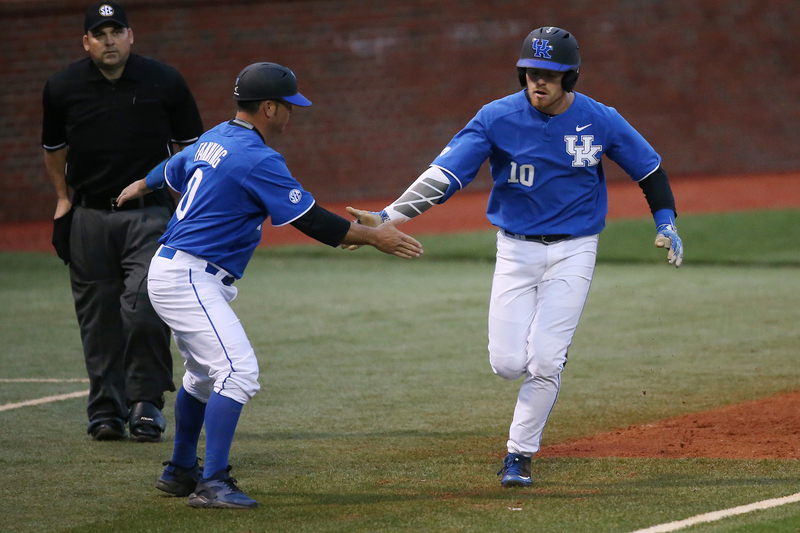 The win also gave the Cats a measure of satisfaction after having lost at Cincinnati 2-1 in 10 innings on March 8. Both of the Bearcats’ runs that day were unearned, including the game-winner that scored on a two-out throwing error. The Cats could not touch up Cincinnati starter A.J. Olasz that day (6.2 innings, 2 hits, 0 runs) but chased him from the game after just four outs this time around, scoring three runs off him. Top 1st – A.J. Bumpass was walked to start the inning. Then, Connor McVey, the next batter, unleashed a hard-hit ball to third base that ended up in LCF, which scored Bumpass from first base. Following McVey’s at bat, R.J. Thompson took first base on a catcher’s interference call. With two runners on, Ryan Noda stepped to the plate and put a ball over the RCF wall for a three-run home run. UC 4, UK 0. Bot 2nd – Riley Mahan led off the inning with a walk and advanced to third on a double to left field from Kole Cottam. Tristan Pompey crushed a ball to center field for a two-RBI double, which scored Mahan and Cottam, and later advanced to third when Troy Squires grounded out to second base. Connor Heady greeted reliever Jarod Yokam with an RBI-double to score Pompey. UC 4, UK 3. Top 3rd – Thompson doubled to LCF and Noda hit his second home run of the game. UC 6, UK 3. Bot 3rd – Luke Becker entered to pinch hit for Luke Heyer and homered to LCF on a 2-0 count. UC 6, UK 4. Bot 5th – Zach Reks, the lead-off batter, was hit by a pitch and advanced to second on a single from Becker. Two batters later, Cottam also was hit by a pitch, which loaded the bases. Pompey and Squires drew bases loaded walks, scoring Reks and Becker. Heady was then hit in the next at bat, plating Cottam. Marcus Carson almost beat the ball to first base on his groundout, but still scored Pompey on the play. Evan White kept things going for UK with a single to right field that brought Squires and Heady home to score. Reks came back around to bat and singled to RCF, advancing White to third. White ended up scoring on the throw from the catcher to second base trying to nab Reks in a rundown. UK 11, UC 6. Bot 8th – Carson led off with a single to center field while White, the following batter, was hit by a pitch. The duo moved to second and third bases after a balk. Carson scored on a wild pitch and White advanced to third. Reks advanced to second on a wild pitch and White scored on the throwing error from the catcher. UK 13, UC 6. Top 9th – Joey Thomas doubled to RCF and moved to third on a wild pitch. Bumpass singled to first base, which brought Thomas in to score. UK 13, UC 7. · The Cats are now 13-1 at home this season. · Junior 1B Evan White went 1-of-4 with two runs and two RBI. o White now has 172 career hits, tied with All-American Collin Cowgill (2005-08) for 21st on UK’s career list. · Sophomore OF Tristan Pompey went 1-of-3 with two runs scored and three RBI. o Pompey’s three RBI were a season-high, besting the two he’s had four different times. o Pompey has had a hit in six straight and 14 of the past 15 games. · Junior OF Luke Becker hit a pinch hit home run in the third inning. o Becker now has two home runs on the season, setting a new season-high. He had one homer last season. · Junior LHP Brad Schaenzer picked up his fourth win of the season. Kentucky hosts No. 22 Vanderbilt in a three-game series beginning Friday night at Cliff Hagan Stadium. Fans can listen on the UK Sports Network via UKathletics.com and iHeart Radio, as well as on 630 AM WLAP. All three games will be aired on SECN+.